Every Fall the leaves change, the days get shorter, the morning air turns crisp, and my wife begins to hint that it’s time to order chocolate. 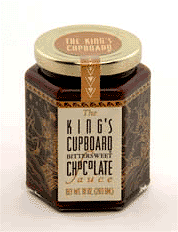 One of the best things that you will ever put in your mouth is the Bittersweet Chocolate Sauce from The Kings Cupboard. They are a family run company in Red Lodge, MT doing what they do best, making unbelievably yummy chocolate sauces. It is positively, absolutely, the best gourmet chocolate sauce you will ever taste. Do yourself a favor and get your own, we’re not sharing ours. Yes Dear, this means I placed an order for a case today, it will be here Friday.